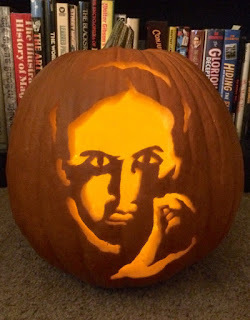 Today marks the 92nd anniversary of Houdini's death on Halloween 1926. But today also marks the start of Houdini's amazing afterlife, in which he not only continued to be the most famous name in magic, but grew to become one of the most famous individuals of the entire 20th century. So what has carried Houdini's name and fame aloft for 92 years? 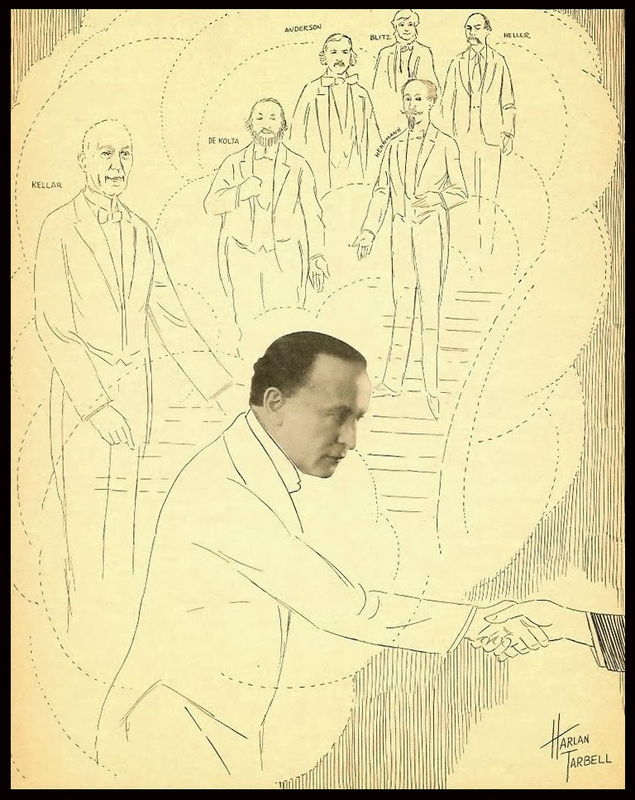 Houdini continued to make headlines even after his death, with news of his collection being donated to the Library of Congress and Bess's battles with insurance companies. Houdini's act also lived on with Hardeen coming out of retirement and touring as "Brother and Legal Successor of Houdini." And, of course, there was the infamous Arthur Ford séances which caused a sensation in 1929. 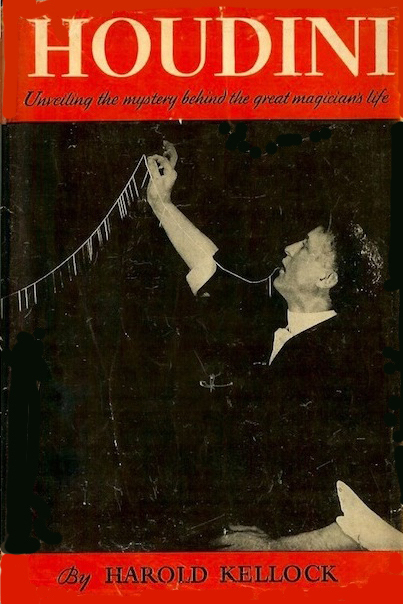 But perhaps the most important first step in cementing Houdini's legend was the serialization and publication of Houdini His Life Story by Harold Kellock, the first major Houdini biography. With its mix of fact and fiction, the Kellock book established how the Houdini story would be told for decades. Other books quickly followed. The Secrets of Houdini by J.C. Cannell traded on the continued fascination with Houdini's secrets, as did Houdini's Escapes and Houdini's Magic by Walter B. Gibson. Houdini and Conan Doyle: The Story of a Strange Friendship by Bernard Ernst and Hereward Carrington became the first specialized Houdini study in 1932. The first news of a Hollywood biopic also surfaced in the '30s, with papers reporting that both RKO and Columbia were developing movies based on the life of the great magician. 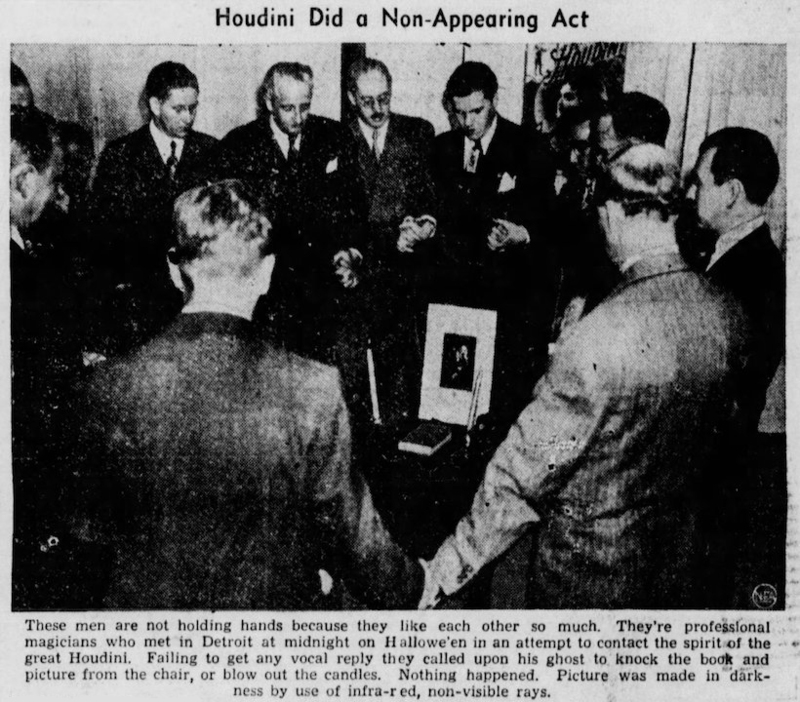 Houdini was again in the headlines in 1936 with The Final Houdini Séance in Hollywood. This was Bess Houdini and Edward Saint's greatest tribute and most successful publicity getter. Two years later Bess appeared as herself in the film Religious Racketeers. But even without Bess and Ed, Houdini's name never left the news. In 1939 it was widely reported that a plumber trapped for 10 hours in a cave-in credited his survival to remembering Houdini's writings about the Shelton Pool Test. In 1941, Walter Winchell shared "A Few Untold Facts about Harry Houdini" in his popular national column. Genii Magazine continued to release an annual "Houdini Memorial Issue" ever October. The '40s also saw publication of The Great Balsamo by Maurice Zolotow, which professed to be a tell-all tale of Houdini's life. Then, in 1946, a group of thirteen magicians, headed by Karrell Fox, held a seance in Detroit for the 20th anniversary of Houdini's death. The event caught the imagination of the media and was widely reported on. The following year, both Joseph Dunninger and Harry Blackstone held competing Houdini Seances on Halloween, kicking off the annual Houdini Seance tradition that continues to this day. 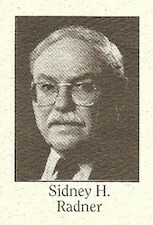 After Hardeen's death in 1945, his former assistant and successor Hardeen Jr. (Douglas Geoffrey) toured with "Houdini Lives Again!" Then in 1950, The Great Houdini by Beryl Williams and Samuel Epstein was published. 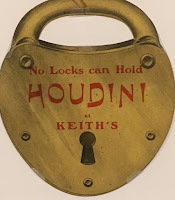 The book would become a gateway to the Houdini story for many kids as it was published by Scholastic and became a staple of grade school libraries. It was also in the 1950s that another seminal event occurred when Paramount released Houdini starring Tony Curtis and Janet Leigh. 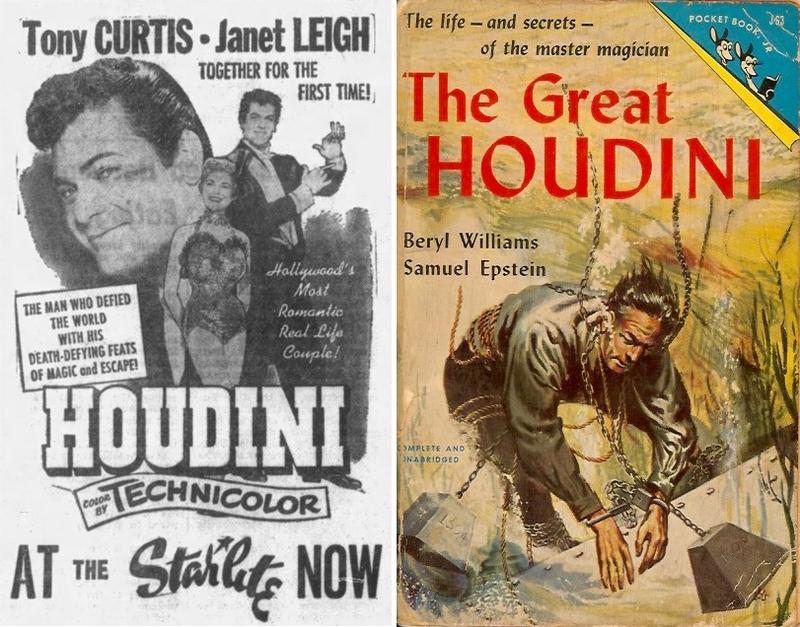 Both the Curtis movie and Epstein book helped spread Houdini's name and fame for decades to come. Houdini The Man Who Walked Through Walls by William Lindsay Gresham became the next important Houdini biography. The book took a big step in correcting many of the myths born in Kellock, while creating a few of its own. The feature documentary Days of Thrills and Laughter reminded audiences of Houdini's film career. John Kennedy even called Richard Nixon a "Houdini" in the final days of the 1960 Presidential campaign. The quip drew national coverage. On January 30, 1965, Paramount's Houdini aired on television for the first time. It became a perennial programer and brought Houdini's story to a new generation (including me). 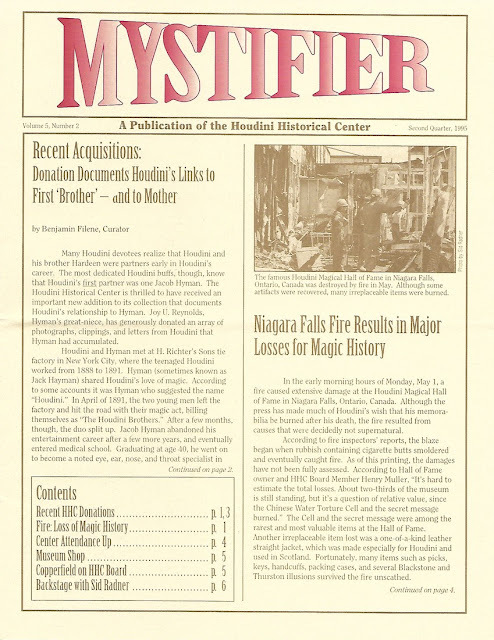 The '60s also saw a London musical, Man of Magic, and the opening of the Houdini Magical Hall of Fame in Niagara Falls, Canada. 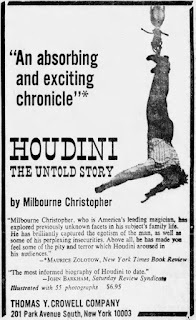 The end of the decade brought the publication of Houdini The Untold Story by Milbourne Christopher, still one of the best and most accurate Houdini biographies ever written. The first Houdini documentary, The Truth About Houdini, aired on the BBC in 1970. 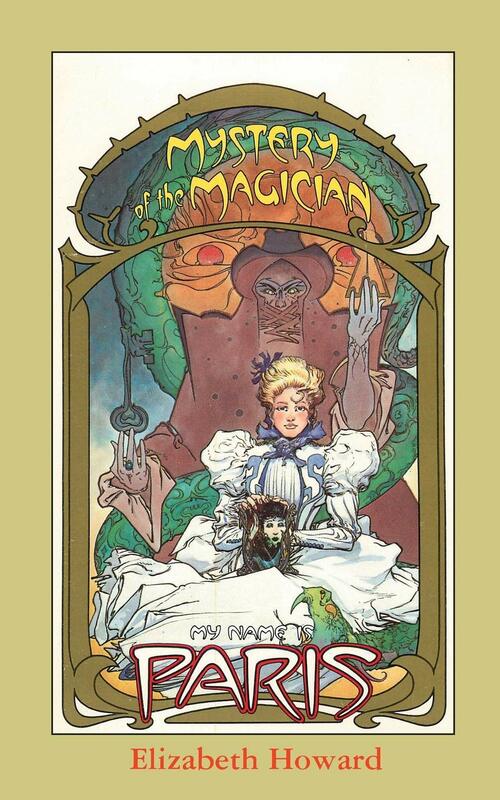 Arno Press reprinted Houdini's A Magician Among the Spirits, and the S.A.M. 's Houdini Birth Research Committee's Report officially recognized Houdini's birthplace as Budapest. As the centenary of Houdini's birth drew near, newspapers widely reported a rumor that a box containing all his secrets would be opened. That never happened. But Doug Henning did open The Magic Show on Broadway, and when he did Houdini's Water Torture Cell on live television in 1975, it launched a second Golden Age of Magic and an explosion of interest in Houdini. 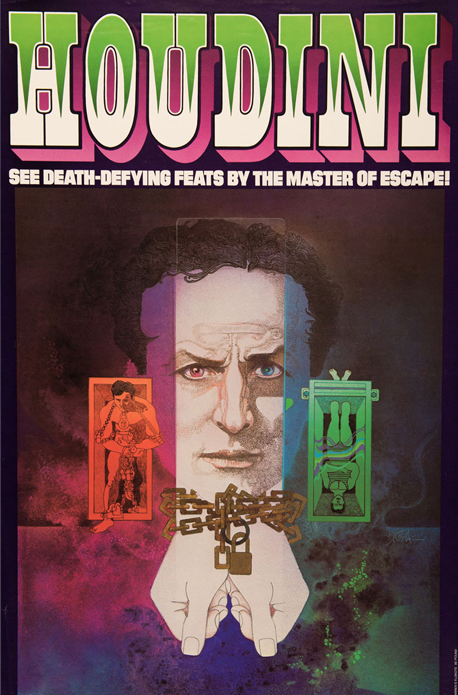 Houdini was inescapable in the mid 1970s. He appeared as a character in the #1 bestseller Ragtime. A new biopic, The Great Houdinis, aired on ABC. The Warren Paper Company put out a Houdini poster that has become iconic in its own right. A legion of new books and reprints appeared. Houdini received a star on the Hollywood Walk of Fame. And the mysterious destruction of his grave bust was big news. Even Fonzie did the Milk Can escape on Happy Days. 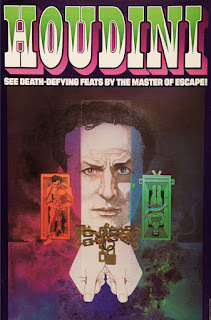 The 1980s saw the documentary Houdini Never Died air on a nascent HBO. A new biography, Death and the Magician: The Mystery of Houdini by Raymund Fitzsimons was published. Appleton dedicated its "Houdini Plaza", and Disney aired Young Harry Houdini. 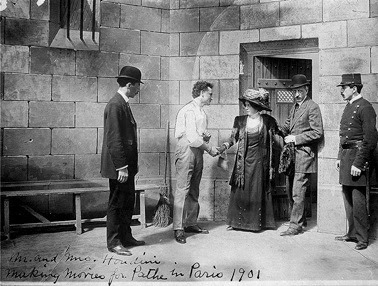 The decade also saw the start of a trend in Houdini fiction that continues to this day, with Houdini meeting everyone from Sherlock Holmes to Dracula. The Houdini Historical Center in Appleton became a center of Houdini study and activity in the 1990s. Houdini (1953) was finally released on VHS amid talk of a new Houdini biopic, this time starring Tom Cruise. The Life and Many Deaths of Harry Houdini by Ruth Brandon hit bookstores. Houdini: The Great Escape aired on A&E's Biography, kicking off a wave of half-hour Houdini documentaries on similar shows. Then, in 1996, Houdini!!! The Career of Ehrich Weiss by Kenneth Silverman was published, setting a new bar for Houdini biographies that has yet to be matched. The '90s also saw FairyTale: A True Story with Harvey Keitel as Houdini, and the TNT Original movie Houdini starring Johnathon Schaech. 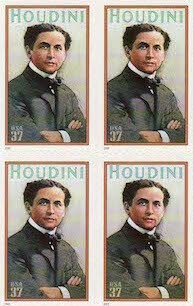 Houdini arrived in the 21st Century as a first class postage stamp. He also appeared as a character in the bestselling Carter Beats The Devil by Glen David Gold. Then came The Secret Life of Houdini: The Making of America's First Superhero by Bill Kalush and Larry Sloman. The book blurred the lines between biography and Houdini fiction with tales of Houdini working as a spy. Hollywood was the only one who bought it, and promised a series of action-packed Houdini spy movies (which have yet to appear). One movie that did appear was the equally fanciful, but far less action-packed, Death Defying Acts with Guy Pearce. In a welcome return to real Houdini history, the centenary of Houdini's historic first flight in Australia was celebrated in Diggers Rest in 2010. That same year saw the Houdini Art and Magic touring exhibition open in New York City. Then on November 10, 2010, WILD ABOUT HARRY was launched. These past eight years have seen some 3922 posts, each one in their own way attesting to the continued popularity and fascination with Houdini. This year alone has seen three major museum exhibitions and a myriad of special events, including 4 seance events today. Next year will see the release of a major new book by Joe Posnanski, the title of which was revealed on Amazon just this week. Appropriately enough, it will be called, The Life and Afterlife of Harry Houdini. 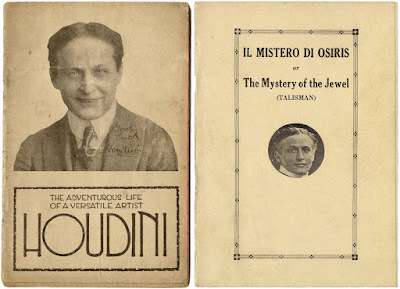 The New Houdini Chronology: A.D.
What if Houdini didn't die in 1926? Tomorrow marks the 92nd anniversary of Houdini's death, and, as usual, there are no shortage of events looking to bring him back! The Official Houdini Seance will be held this year in Baltimore at the Jewish Museum of Maryland. 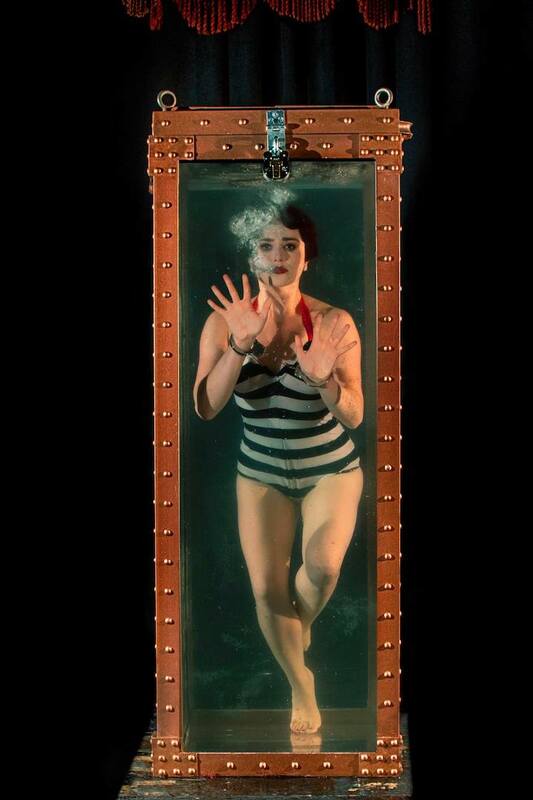 The event will feature talks by Houdini experts and performances by magicians. 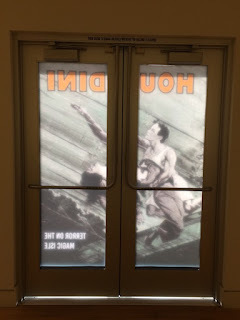 The museum is currently home to the exhibition Inescapable: The Life and Legacy of Harry Houdini. Note: This event is SOLD OUT. 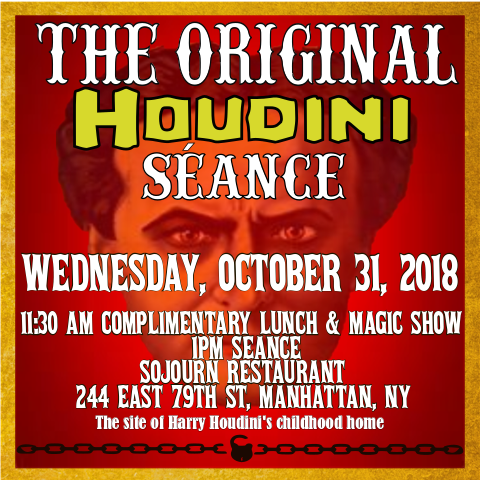 The Original Houdini Seance will once again be held at Sojourn Restaurant in New York City, the site of Houdini's boyhood home. 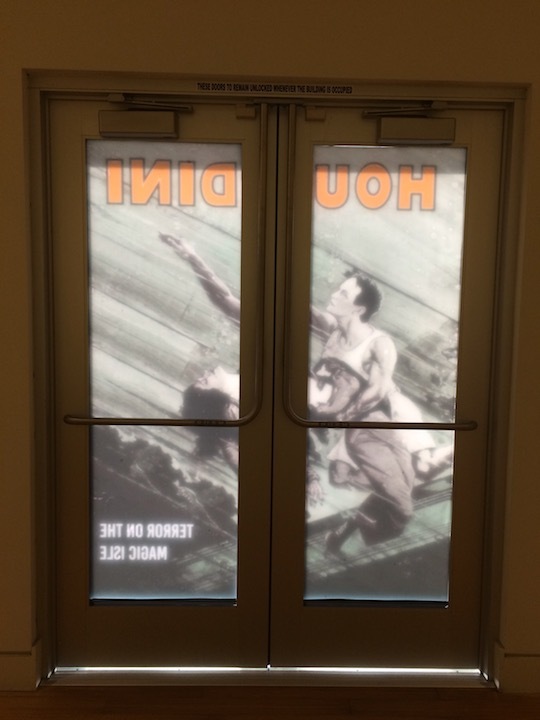 Guests of honor will include author Alain Nu and Cynthia von Buhler, whose show The Girl Who Handcuffed Houdini is playing to rave reviews (and will have a Halloween night performance). The seance starts at 11:30 AM and is free, but you'll need to register HERE. Dixie Dooley will hold his 33rd Annual Houdini Seance in Las Vegas. The seance starts at 1:26 PM at Headz Up in the Boulevard Mall, 3542 South Maryland Pkwy. Admission is free, but arrive early for preferred seating. Psychic Comedienne and Medium Jill Marie Morris will again hold her Harry Houdini Halloween Vigil at Dearly Departed Tours & Museum in Hollywood, CA. Note: This event is SOLD OUT. 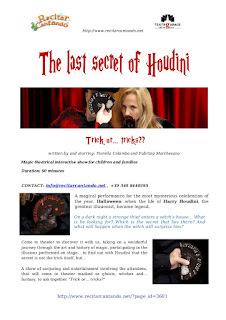 Italy will see The Last Secret of Houdini interactive magic show starring Fiorella Colombo and Fabrizio Marchesano. For more information visit the official website or Facebook. Which event will Houdini attend? Stay tuned! Houdini 2018 Halloween jack-o’-lantern by Tom Interval at Houdini Museum. 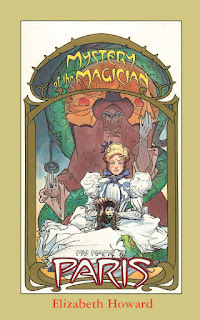 Mystery and the Magician (My name is Paris) by Elizabeth Howard was one of the early works of Houdini fiction. First released by Random House in 1987, a reprinted edition is now available. Paris Mackenzie is a sixteen-year-old from Chicago with an irrepressible personality and a passion for Sherlock Holmes. When she visits her namesake city at the turn of the century, Paris finds all the glamour and romance she ever dreamed of. But the city's glittering façade hides a dark underside, whose danger is like a magnet to the intrepid Paris, pulling her closer and closer to treachery, deceit. . . and even murder. When Paris receives a beautiful Art Nouveau mirror from an auction house, little does she suspect it hides a secret for which people will kill. Suddenly her life is threatened and the mirror is stolen. When Houdini, the world-famous escape artist, is boldly abducted during a theatrical performance before her eyes only hours after the theft, Paris is horrified. She suspects a mysterious link between the mirror's secret and the magician's fate, but can she discover it in time to save Houdini? Purchase Mystery and the Magician (My name is Paris) on Amazon.com and Amazon.co.uk. Jack Hoeffler remembers the "Prince of the Air"
Houdini always marked October 28, 1883 as the day he made his professional show business debut. Because it was on this day exactly 135 years ago that he appeared as a trapeze artist in Jack Hoeffler's 5¢ Circus billed as "Ehrich Prince of the Air." And just in case one might think this is mythology, below is a clipping from the September 29, 1915 Appleton Post Crescent in which records Hoeffler's visit to his old friend in St. Paul where he recalls the historic engagement. One area for debate is Hoeffler says they lived in Appleton, which implies his circus was there as well. But by 1883, the Weiss family had moved to Milwaukee, and this is where most biographers say the circus took place. But the math in this account ("thirty-four years ago") would put his debut in 1881, and thus in Appleton. However, on other occasions, Houdini set it in 1883. But we all know how sloppy Houdini could be with dates! Regardless, how fun to hear from Jack Hoeffler himself and find evidence of Houdini's professional debut...135 (or 137) years ago today. Action figures and dolls are one area Houdini has not yet conquered. 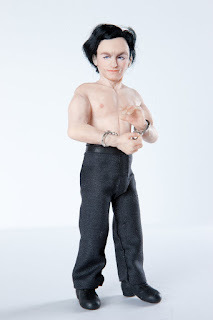 Apart from a figure Houdini created himself--of which only a prototype was made--there was the Accoutrements "Action Figure" in 2005. But not much else. Now a Russian artist has created this Houdini doll in polymer clay, and it's a little creepy! But artistic. You can buy little Houdini at Livemaster. Here's some great news that could have an impact on Houdini film history. The below press release was recently issued by our friends at Magicana. Magicana is delighted to announce the acquisition of the McIlhany Film Archive of historical magic film and videos. In September, it was confirmed that we were the successful bidder for the collection through a sealed-bid auction conducted by The Magic Auctioneer David Goodman in cooperation with Owen Magic Supreme. And what a collection it is! 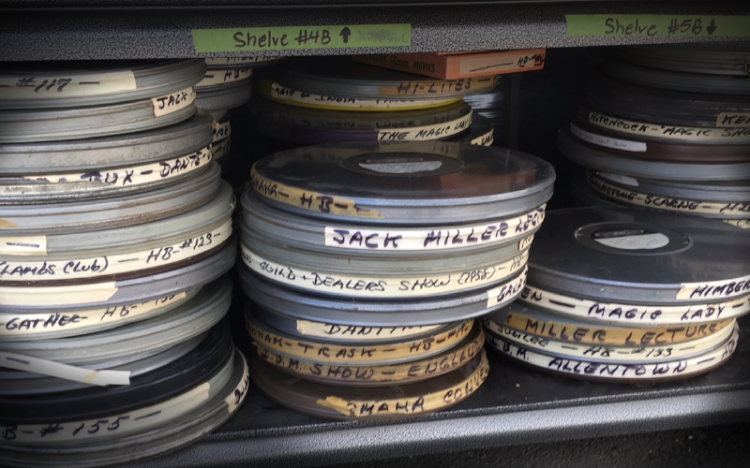 With over 250 reels of 16mm film, nearly 100 reels of 8mm film, and over 75 cartons of videotapes, we are astonished and, frankly, overwhelmed with the sheer volume of what Bill McIlhany amassed over his years as an avid collector. Always with the love of film at the heart of his magic-collecting passion, Bill collected magic featured in this medium from several notable sources, including Karrell Fox, Marvyn Roy, Ricki Dunn and John Booth. Bill was a frequent speaker at magic history conventions and took great delight in highlighting just how much magic was featured in early theatrical film and television. He was also a notable film and television consultant on magicians in the movies, and he shared his collection and expertise on several documentaries. Bill passed away in May 2017; he was 66. While still stunned by the size of the lot, we are extremely pleased that we can, over time, add this treasure trove to The Screening Room. Soon we will be able to offer rare footage of performances, cameos, hand stand-ins and more of the great magical names listed above, among many others. 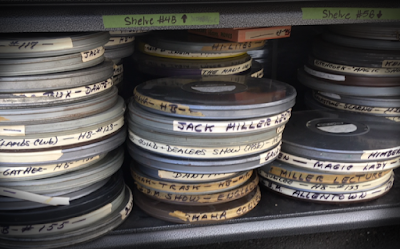 It will take some time to catalog, digitize and add this immense media load to our database, but we’re certain you will agree with us… it’ll all be worth the wait. So what's the Houdini connection? I've long heard that Bill had a near complete copy of Houdini's 1909 film, Les merveilleux exploits de Houdini à Paris, on VHS. However, the last time I spoke with him (around the time of my Hollywood Heritage lecture), he was in declining health and couldn't find it. It's likely the film is on one of the vast amounts of unscreened tapes now in the possession of Magicana. So here's hoping they will turn up this lost Houdini gem! Did Houdini's furniture sell on eBay in 2007? 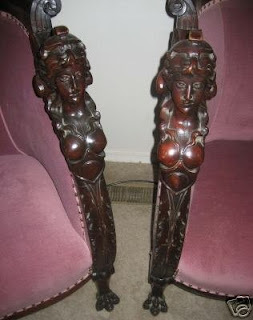 In March 2007 a set of two chairs and a settee said to have belonged to Houdini sold on eBay. Below are photos and the intriguing original auction description. An original Karpen Bros., (Houdini?) settee and chair made in the Victorian 1800-1900s era. I will do my best to describe this. 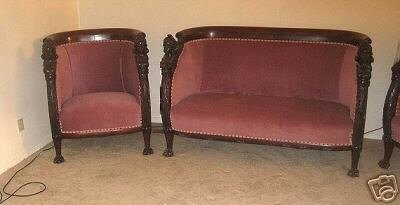 It is hand carved from mahogany wood and has been reupholstered in mauve velvet. When it was reupholstered the original Karpen Bros. tags were removed and never put back on. Why? I don't know. I don't know where they went to. It originally was a deep red leather that had become torn. The arms are Goddesses w/victor helmets on their heads. The eyes of the Goddesses had red stones in the eyes but were taken out in later years. The settee measures 57" long x 36" high, the chair measures 36" wide x 20" high, both are 22" deep from front to back. The pair has never been set on since it was reupholstered. Used for decorative purposes only. This is the story on this set. My girlfriend, whom I am selling this for, now owns the set. Her mother, (who is still living), and father were in show business back in the 1900s. They had met Houdini and had their picture taken with him when he was sitting in this chair. He had the set commissioned and the Goddesses are supposed to be replicas of his mother. They fell in love with the set. In 1946 her parents saw the set was on the auction block at Cameron's Auction House on Ohio St. in Chicago, Ill. and they bid on them, winning the bid. Some years later they took pics and sent them to Sotheby's for authentication. 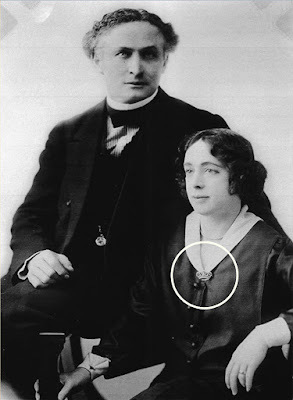 They could not authenticate that they had actually belonged to Houdini. My girlfriend's mother says it definitely came from Houdini but I can't verify it, only her word. All in all they are quite exquisite. The price is for the pair. Please ask any questions before bidding as all sales are final. The chairs appear to match the one seen in Houdini's famous ectoplasm photo (below), so there might be something to this. If anyone has any information on what became of these, please contact me or leave a comment below. On Sunday, November 4th, I will be giving a talk on "Houdini in Hollywood" and screening The Grim Game at The Jewish Museum of Maryland. Below are details. At 2pm join us for a screening of The Grim Game, starring Harry Houdini. Being able to see The Grim Game is now a rare treat. The movie never did materialize on DVD and has never repeated on TCM. So it remains the hardest of all of Houdini's movies to see. And if you need an extra inducement, know that during my talk I will show the recently discovered lost overboard box footage from Terror Island. 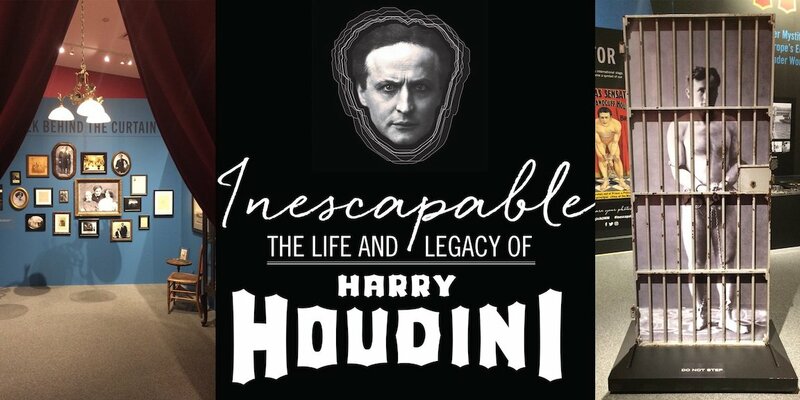 The Jewish Museum of Maryland's exhibition Inescapable: The Life and Legacy of Harry Houdini runs through January 21, 2019. For more information and a full list of upcoming events visit their website. Terror Island overboard box escape footage FOUND! 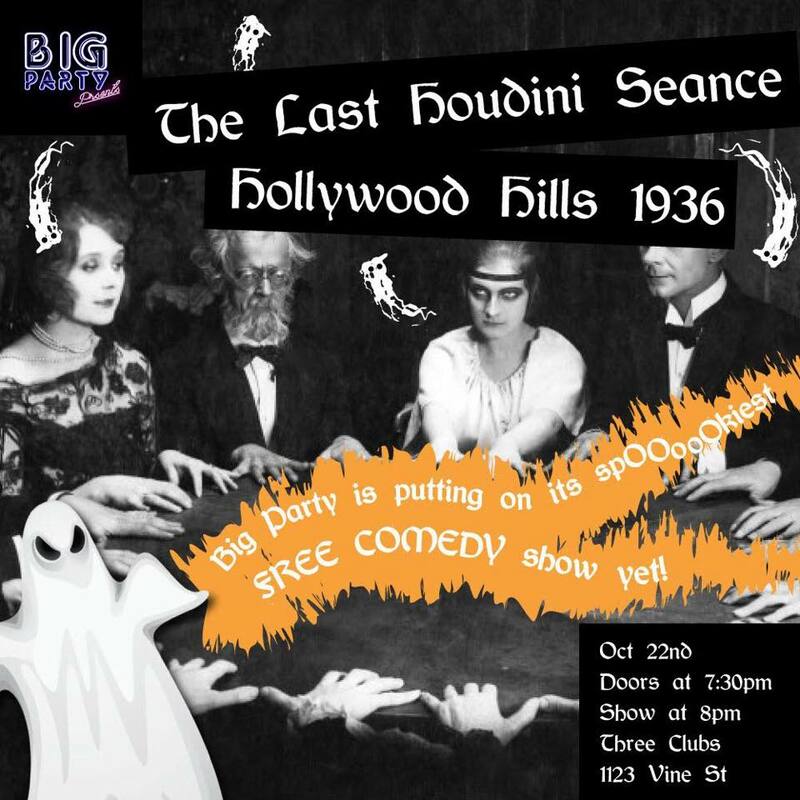 Last night I had the pleasure of attending The Last Houdini Seance performed by the Big Party Show at Three Clubs in Hollywood. It was a very funny show put on by a talented group of young comedians that was raucous while still respectful to Houdini. 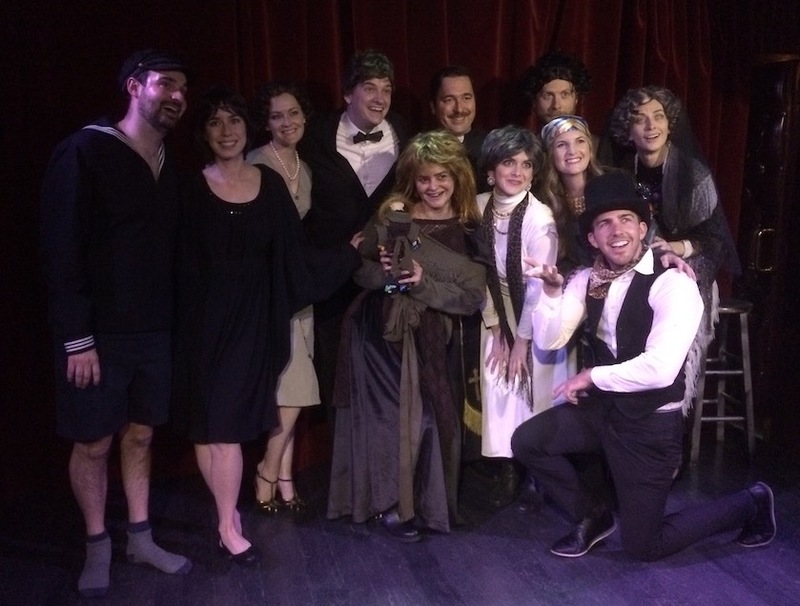 The show found Bess Houdini (Rebecca Warm) and her put-upon new husband "Phillip" (Steve Szlaga) gathering a group of fellow eccentrics for the Final Houdini Seance in 1936. Each character took the stage for an individual comedy sketch (I'm assuming of their own creations). It was a great showcase of young talent before a full house, and clearly some research had been done (especially on the part of Rebecca). And what fun it was to be among an audience chanting "Houdini! Houdini!" just blocks away from where the real seance happened in 1936. Houdini never dies in Hollywood. The troupe even engineered a spooky finale in which they feigned technical problems and left the audience sitting alone in the dark... only to have Houdini come back for one last big scare. Congrats to all the performers on a terrific show. 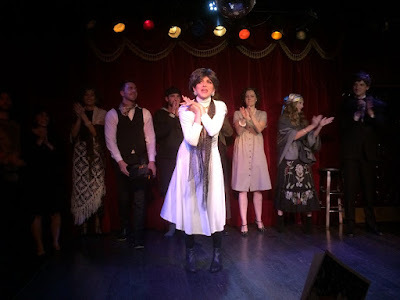 Here's a terrific photo of Pearls Daily as Minky Woodcock in the Immersive Theater Experience based on Cynthia von Buhler's graphic novel The Girl Who Handcuffed Houdini currently playing at Theatre 80 in New York City. The play dramatizes the events that lead up to Houdini's death on Halloween; events that largely took place 92 years ago this week (today is punch day). So what a perfect time to see this! The Girl Who Handcuffed Houdini also stars Vincent Cinque as Houdini and Robyn Adele Anderson as Bess. It's written and directed by Cynthia von Buhler and has received a fair share of rave reviews. For more information and showtimes visit the official website. The play runs until November 10th. You can see many more photos at Cynthia von Buhler's Facebook page. The Houdini Halloween events are going international this year. In Italy you can enjoy The Last Secret of Houdini, an interactive magic show for children and families written by and starring Fiorella Colombo and Fabrizio Marchesano. For more information visit the official website or Facebook. Today saw Potter & Potter's auction of "Houdiniana" featuring many items from the collection of our late friend John Bushey. 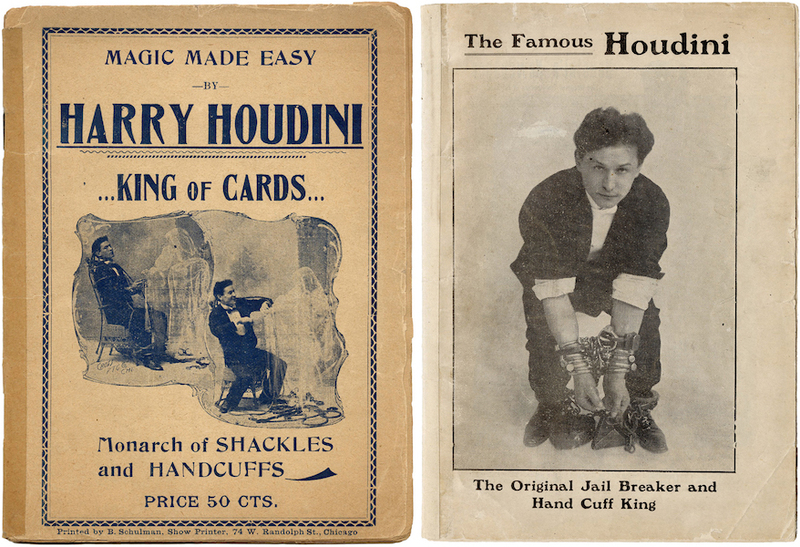 John's specialty was Houdini pitchbooks, and the rarest of those sold for big bucks. The top seller was Houdini's ultra rare 1898 Magic Made Easy pitchbook at $9,600 (all prices quoted here include 20% premium). This doubles the price of one that sold on eBay in 2007. Another rare 1907 pitchbook titled The Famous Houdini (the only one I think I've ever seen) came in at $7,200. 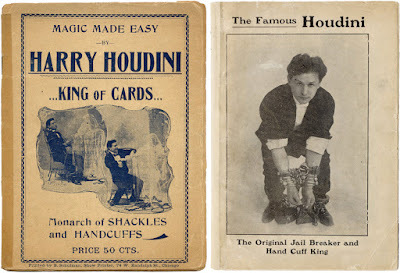 Magic Made Easy - $9,600 | The Famous Houdini - $7,200. The Adventurous Life of a Versatile Artist with a rare variant cover grabbed $5,040. 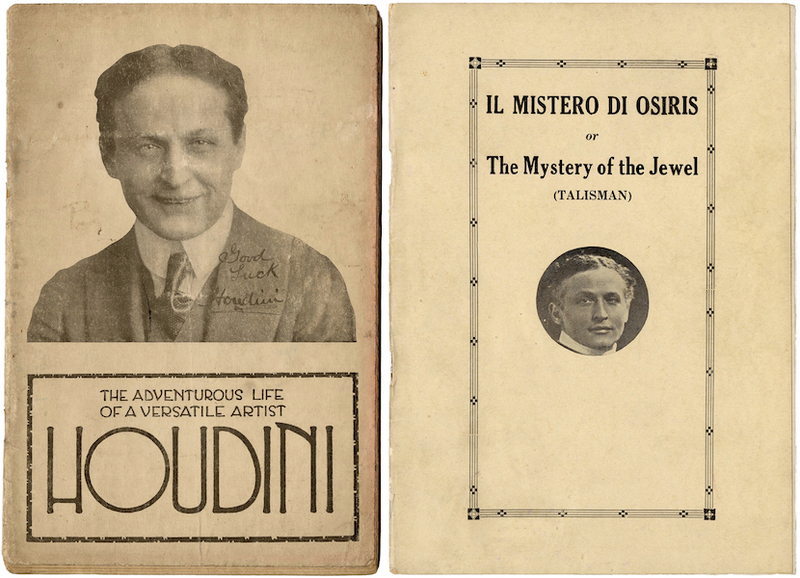 A copy of Houdini's The Mystery of the Jewel movie treatment brought in $4,080. Adventurous Life - $5,040 | Mystery of the Jewel - $4,080. But the auction had more than just pitchbooks. A Buried Alive poster fetched $7,800. A pair of Providence Tool Co. handcuffs with good provenance sold for $11,400. An unpublished photo of Houdini jumping handcuffed from a gazebo sold for $3,600. Another unpublished photo of Houdini, Bess, and Mama in Germany brought in $1,560. I actually thought this latter photo could have gone higher as Mama pics are few and far between. Congrats to all the winners and to Potter & Potter for another great auction. Here's a terrific article from the April 27, 1916 Baltimore Evening Sun. 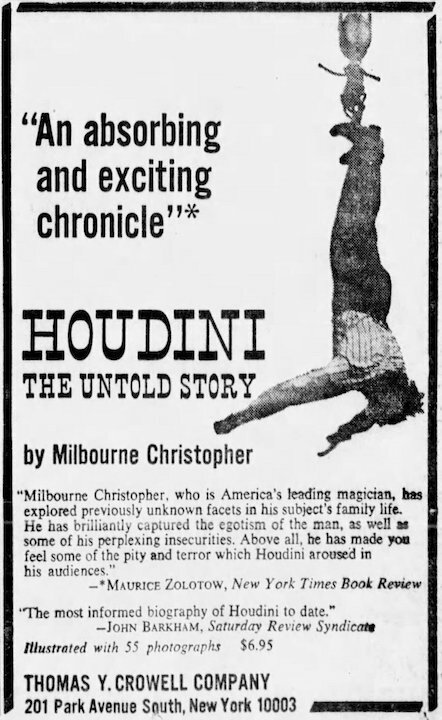 This ran the day after Houdini's suspended straitjacket escape from the Sun building before a crowd of 50,000. I'm always excited to find something like this that not only gives us fresh insight into Bess, but also provides untypical details about an outdoor stunt. And an awesome new photo! While I'm sure Bess was able to act the part of the "worried wife/assistant" when called upon, there are details here, such as being concerned about his internal organs, that makes me think her anxiety about this particular stunt was genuine. And recall the postcard I recently shared written on the day of his suspended straitjacket escape in Kansas City in which Bess wished she was home in Brooklyn "where I belong." Speaking of Baltimore, I will be appearing at The Jewish Museum of Maryland on November 4th with a talk about Houdini in Hollywood and screening of The Grim Game. If I have time, I will seek out the location of this escape. And I will look up! The Houdini Museum in Scranton will once again hold their "Original Houdini Seance" at Sojourn Restaurant in New York City on October 31. Special guest of honor this year will be mentalist, television personality, and author Alain Nu. The seance begins at 11:30 AM and is open to the public. 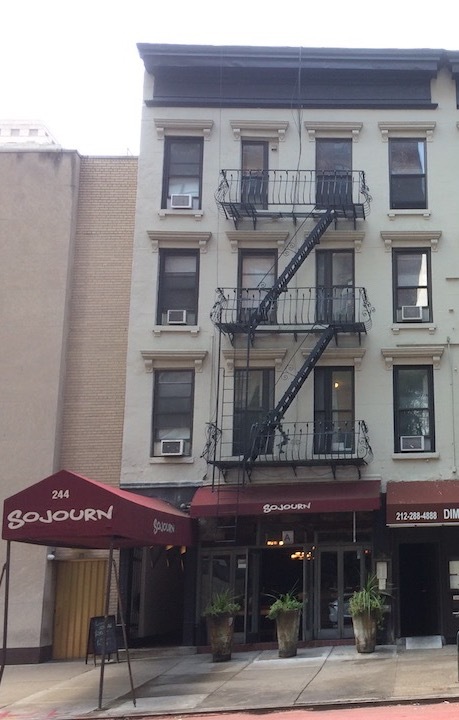 Sojourn is located at 244 East 79 St. in a building that was once Mrs. Loeffler's Boarding House. It was here that young Ehrich Weiss and his family lived when they moved to New York in 1887. 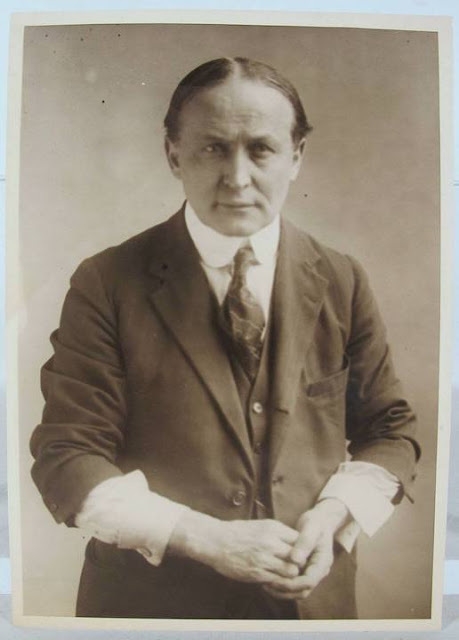 The Original Houdini Seance (not to be confused with the Official Houdini Seance which this year is being held in Baltimore) traces back to Walter B. Gibson, who suggested to Dorothy Dietrich that she carry on the annual seance tradition. This is the third Original Seance to be held at Sojourn. Will the third time be the charm? UPDATE: You can now RSVP for the seance HERE. 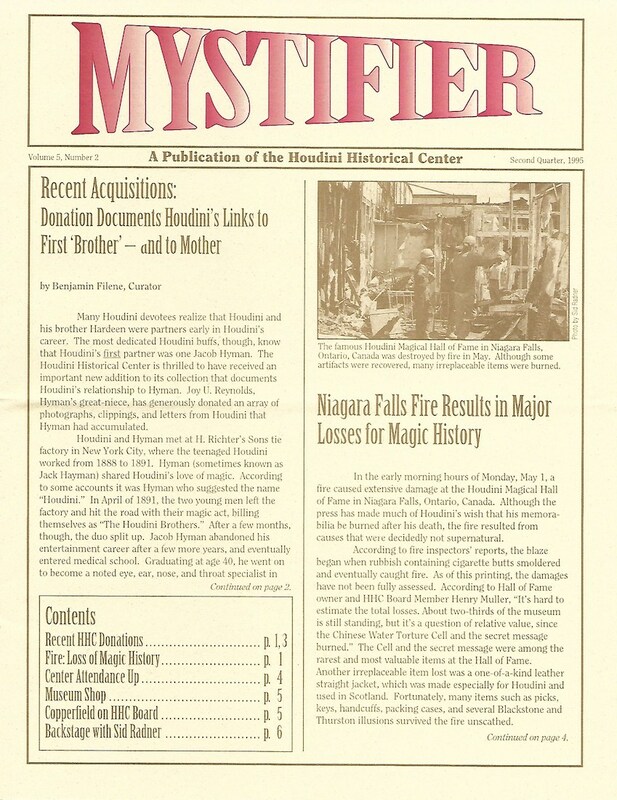 The Second Quarter 1995 Mystifier opens with the news that a collection of photographs, clippings, and letters related to Houdini's first performing partner Jacob Hyman was donated to the HHC by Joy U. Reynolds, Hyman's great-niece. (As this was not part of the Radner collection, presumably the material is still held in Appleton.) That's the good news. According to fire inspectors' reports, the blaze began when rubbish containing cigarette butts smoldered and eventually caught fire. As of this printing, the damages have not been fully assessed. According to Hall of Fame owner and HHC Board Member Henry Muller, "It's hard to estimate the total losses. 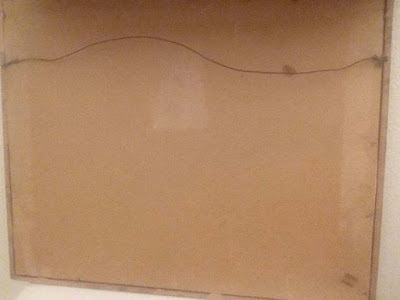 About two-thirds of the museum is still standing, but it's a question of relative value, since the Chinese Water Torture Cell and the secret message burned." [...] Another irreplaceable item lost was a one-of-kind leather straitjacket, which was made especially for Houdini and used in Scotland. Fortunately, many items such as picks, keys, handcuffs, packing cases, and several Blackstone and Thurston illusions survived the fire unscathed. Dr. Morris N. Young then writes about meeting Dorothy Young, and how, on his suggestion, she painted a portrait of Houdini "as she has seen him in 1926." Dr. Young says the painting was donated to the HHC for display. I don't believe I've ever seen this, but would love to! Sid Radner devotes the first part of his "Backstage" column to the Hall of Fame fire. He says that a planned auction of several of the illusions housed at the museum will no longer go forward. He also writes that "the loss of the Water Torture Cell could present a fresh opportunity to lobby for Houdini postage stamp featuring the cell." Sid then notes that James Bond author John Gardner is a member of the HHC. He reports that the HHC was recently mentioned on Jeopardy!, and that Houdini's connection to Appleton was included in the April 4, 1995 New York Times crossword. He also announces the upcoming publication of "a very important limited edition book explaining how Houdini came to America", and that there will be a new restaurant chain similar to the Hard Rock Cafe with a Houdini/magic theme. The book, Houdini Comes To America by Ronald J. Hilgert, appeared the following year. The restaurant never materialized. 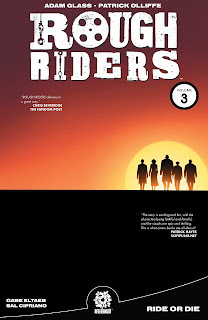 Today sees the release of the collected edition of Adam Glass's Rough Riders: Ride or Die. This is the third and final (?) installment of the popular series that features Houdini joining forces with the likes of Teddy Roosevelt, Thomas Edison, and Annie Oakley. It’s 1906 and Theodore Roosevelt is the sitting president when a familiar face from his past asks him once again to call upon the Rough Riders to save the world. But this time it’s not anarchists or aliens―no, it’s something from the great beyond. Something so ancient and inherently evil that the Rough Riders will need to add to their ranks in hopes of defeating it. Will HP Lovecraft be the newest historical figure to have the honor to call themselves a Rough Rider? Or will he be the one who finally brings death to the history's greatest team? 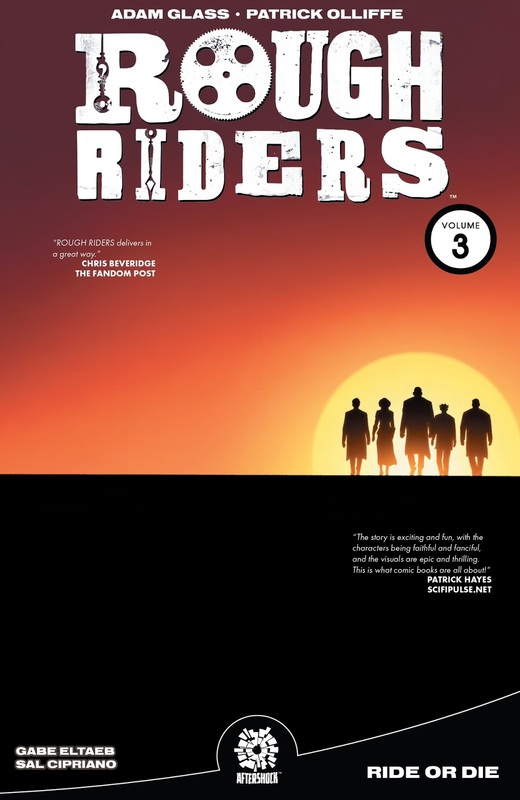 The collected Rough Riders Vol. 3: Ride or Die can be purchased at Amazon.com (U.S.) and Amazon.co.uk (UK). The Big Party Show is putting on a Houdini-themed Halloween comedy show on Monday, October 22, at The Three Clubs in Hollywood. Below are details. Just in time for Halloween, Big Party is putting on its spOOooOOkiest FREE COMEDY show yet! Tinsel Town elite, paranormal experts, and revelers of the macabre have all descended on the Knickerbocker Hotel with the same goal. To try to contact the spirit of Harry Houdini one last time. Oooooh I'm getting chills already! **This is a comedy show. Not a real seance. You might not think this disclaimer is necessary but hey, it's Hollywood. You never know." The event is $1 at the door or free online. You can reserve a ticket via Eventbright. For more information check out the Facebook event page. Bess originally planned Final Houdini Seance as a "hunt for magician ghosts"
This fabulous photo of Houdini sold on eBay tonight for $565.99. I've never seen this image. The auction dates this as 1920, but I would put it later (1924-6). It appears this might have been taken at the same time as this photo of Houdini with a pocket watch and this shot of Houdini's hands. Thanks to Kevin Connolly at his CONJURING HISTORY Facebook group for the alert. Noted Houdini collector and all around good guy Kenneth Trombly will give a talk called "Capturing Houdini" at The Jewish Museum of Maryland next Sunday, October 21 at 1pm. Below are details. Supplemented with an array of vintage material that he has assembled over the past 35 years, Ken will enchant us with tales about Ehrich Weiss, a humble rabbi’s son from Hungary who would reinvent himself to become one of the greatest superstars of all time. The talk is free but a seat reservation is required. Click for info. 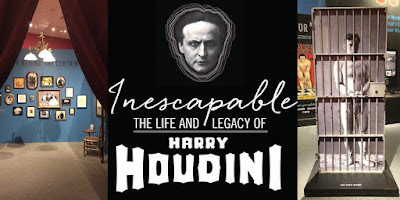 The Jewish Museum of Maryland's exhibition Inescapable: The Life and Legacy of Harry Houdini runs through January 21, 2019. For more information and a full list of events (including my own talk on Nov. 4), visit their website. Pitchford’s great uncle is Richard Valentine Pitchford, a prominent magician in the early 1900s who went by the stage name Cardini. Cardini was so influential that there is an exhibit dedicated to him at the Magic Castle in Hollywood. “All the props on display in the exhibit are artifacts that my wife and I left to the Academy of Magical Arts for the museum display,” Pitchford tells me. Pitchford himself is also a prominent member of the organization. Recently, Pitchford and his wife, Kristy, were at a pyjama party with the Magic Castle’s founder, Milt Larsen, in Santa Barbara. Milt Larsen’s wife, Arlene, decides she wants to turn Kristy Pitchford into a queen, so she pops a bejewelled tiara on her head and drapes a brooch around her neck. “After all this goes down, Arlene explains that, ‘that broach that I put around your neck, it once belonged to Bess Houdini’,” Pitchford remembers. A while after the party, the Larsens put the brooch up for auction to raise money for a Magic Castle cabaret in Santa Barbara, but Pitchford can’t make it to the auction. The piece is estimated to reach $30,000, so he puts in a proxy bid for $55,000. The brooch goes for $60,000. The buyer? David Copperfield. Pitchford didn’t care if the story was fabricated, though. He cared that it belonged to the Houdinis and made his wife happy. Copperfield said he could have it for his buying price: $72,000, with fees. “He’s like, can you bring cash?,” Pitchford laughs. “I’m about to get on a flight to Vegas because I’m working with Penn and Teller on a VR project – Penn and Teller’s VR: Frankly Unfair Unkind, Underhanded and Unnecessary. it’s effectively a collection of VR magic tricks. As the above suggests, the story of the brooch coming from Tsar Nicholas II is questionable (I suspect the Facebook link it talks about was this one). 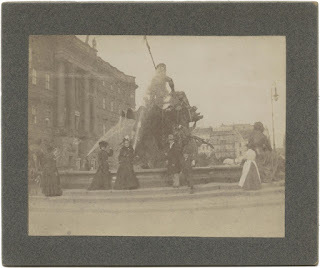 It's much more likely that it came from Grand Duke Sergei Alexsandrovich, whom the Houdinis performed for in Moscow in 1903 and who gave them gifts. Even Gerrie Larsen said as much in 1952. But over time and retellings, the Grand Duke became the Tsar. But who can keep Russian royalty straight anyway? But it's great to know that the brooch has now landed with the Pitchfords and continues to live among magic royalty. 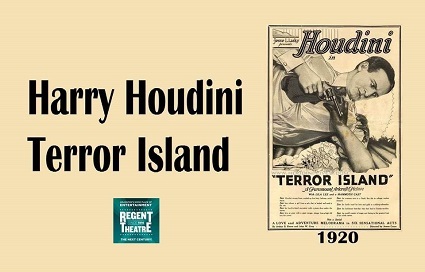 The Regent Theater in Arlington, Massachusetts, will host a “Harry Houdini Halloween Happening!” on October 26 with a screening of Terror Island and more. Below are details. 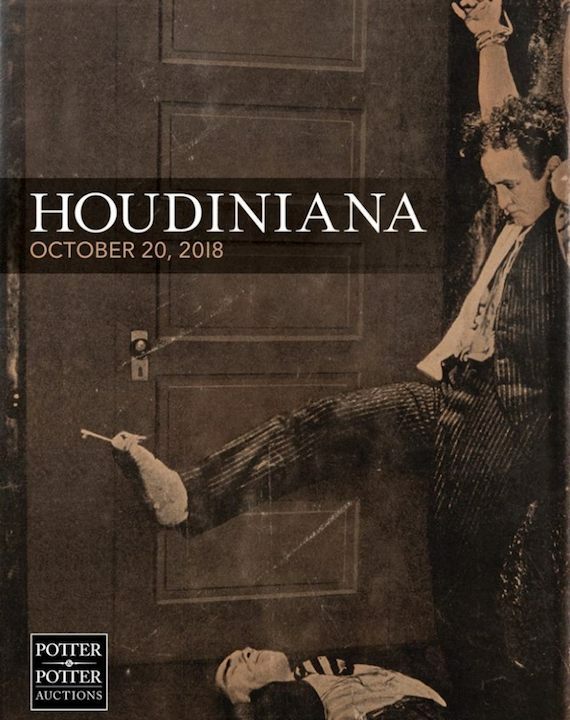 Escape to the Regent for a special tribute to HOUDINI, on both stage and screen, on October 26, 2018. Jeff Rapsis opens the film vault to present Houdini’s long-lost silent movie, Terror Island, complete with live musical accompaniment. Professional magicians David Garrity and Matt Roberts will leave you astonished with their jaw-dropping illusions, interactive feats of escapology and even a spooky demonstration of the spiritualism that Houdini crusaded against, just in time for Halloween (the night the legendary magician died in 1926). For more information and to buy tickets visit the Regent website. Recently Tom Morello shared with me with a remarkable treasure that he has owned for over 40 years. 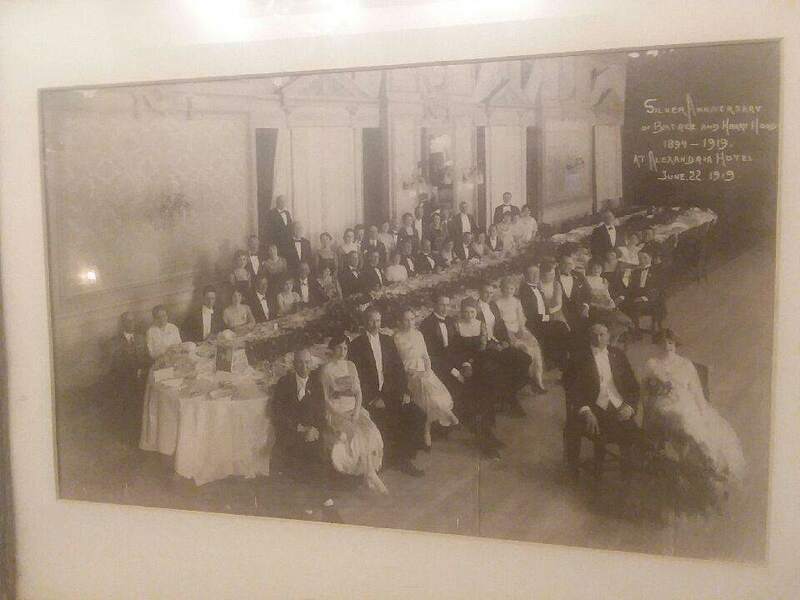 It's the famous group photo of the Houdinis Silver Wedding Anniversary held at the Los Angeles Alexandria Hotel on June 22, 1919. According to Tom, this is the framed photo that hung in the Houdinis home in New York. Tom acquired the photo in 1977 from Kevin St. Onge, who had purchased it from Terry Roses. Terry had acquired it from Joe Berg, who received it from Bess Houdini herself. Tom has never taken it outside of the frame, but be believes there is some writing on the back. 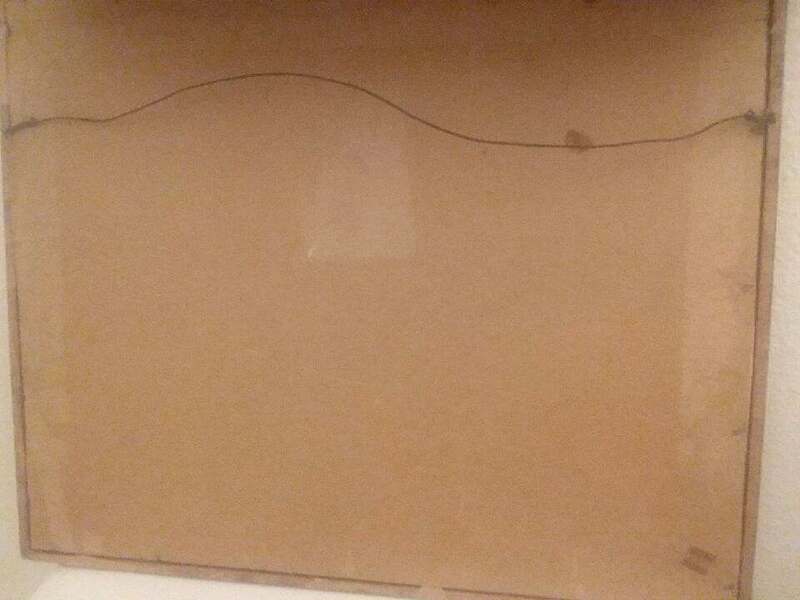 As you can see from the image above, the photo is complete, unlike the one seen in Houdini His Legend and His Magic and at the Library of Congress. Tom is now looking to sell this long held treasure. If you are interested, contact him VIA EMAIL HERE. I've not see the photo in person, so if you have questions, please direct them to Tom. Thanks for the share, Tom! Did the Houdinis marry in 1901? Last Saturday I had the pleasure of speaking at the Workman & Temple Family Homestead Museum's "Ticket to the Twenties" festival in City of Industry. It was a great turn out, and I especially enjoyed the Q&A sessions. We seemed to cover it all; from Hardeen to biopics to Houdini's middle name. Thanks to everyone who came. The festival itself was a blast, with people dressed in period clothes and '20s Jazz bands playing amid vintage cars. I was happy to see Joe Notaro (HHCE), as well as some blog readers and fellow Magic Castle members. As the festival stage was outside, I didn't do my normal audio/visual presentation. But the very helpful museum staff offered to create some visual aids for me. One of the four images I sent them was the famous photo of Houdini inside 278 producing ectoplasm ("Houdini materializing Houdini"). To get a good enlargement, I purchased a high resolution image from the McCord Museum in Montreal, who hold an original. In doing so, I discovered something in this photo that I had never seen before! Now, I had always assumed this photo was accomplished with some measure of trick photography, just like the other spirit photographs taken inside 278. But on receiving the high res version, I could plainly see that is not the case. Everything in this photo is actually present and practical. 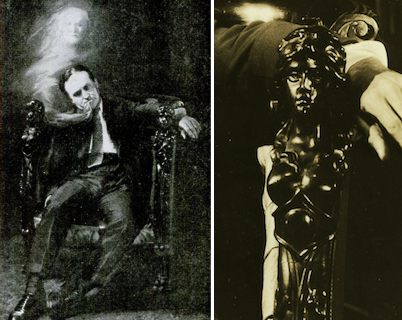 Houdini's ectoplasmic projection is a face-mask or mannequin head, possibly one he used for his silent movies? But what I found especially exciting--and what I shared in my talks--is that through the ectoplasmic gauze one can see the fingers of a woman's hand gripping the base of the head. So there is a concealed assistant (maybe Bess?) hiding behind Houdini's chair making the head appear to float, which certainly must have been a creepy effect. I do not have a license from the McCord to publish the photo online, but the Homestead museum staff was kind enough to let me have this particular blowup, so I will share it when and where I can. I'm also hoping to return to the Homestead Museum for more talks and events in the future. The Workman & Temple Family Homestead Museum is located at 15415 East Don Julian Road in the City of Industry, CA. For full details visit the official website. Thanks Gennie Truelock, Misty Lee, and Joe Notaro. UPDATE: Joe has posted his own account of the festival here: Ticket to the Twenties – Houdini Among the Spirits plus. Come hear me talk Houdini and the spirits at "Ticket to the Twenties"
Today sees the release of After Houdini, a new graphic novel by Jeremy Holt with art by John Lucas. Below is the terrific cover art and plot synopsis. Harry Houdini, master magician and covert spy for the United States, has been kidnapped. The only man who can save him is his estranged son Josef, who, like his father, knows the power of magic—and how it can be more than just an illusion. Josef Houdini takes after his father: A gifted escape artist, there’s not a jam he can’t get himself out of. Then again, when your father is one of the greatest illusionists of all time, that comes as no surprise. What does come as a surprise is the fact that Harry Houdini is not only the world’s greatest magician, but also a top-secret operative for the US government during World War I. In rare form he finds himself trapped—stuck on a mission he is unable to escape from. That’s why the government needs his son to fill his shoes and complete the mission—but does Josef have the wherewithal to do it? Or is the possibility of success just an illusion? Packed with intrigue, suspense, and fantasy, After Houdini is a revisionist look at one of history’s most mysterious figures that is sure to take readers on a journey they’ll never forget. Purchase After Houdini at Amazon.com (U.S.) and Amazon.co.uk (UK). Next year will see a follow-up volume, Before Houdini. CNN reports that two photographs which famously fooled Sir Arthur Conan Doyle into believing in fairies sold at a UK auction for £20,400 ($26,674), more than ten times their estimate. The images of the "Cottingley Fairies" were taken by 16-year-old Elsie Wright and her nine-year-old cousin Frances Griffiths. The girls used hat pins and paper cutouts to stage the scenes near a stream in Elsie's garden. The photos caused a sensation in 1919 when their mother presented them to the Theosophical Society in Bradford as genuine. 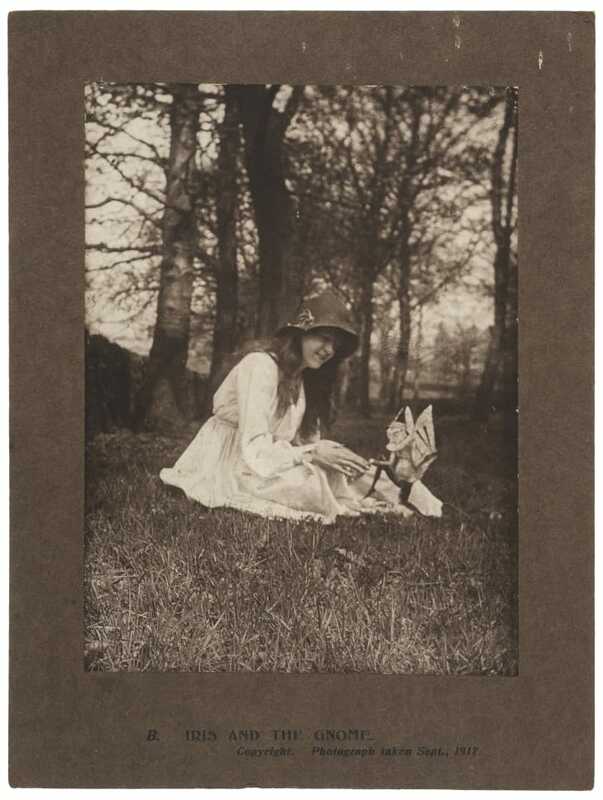 A photo that shows Frances surrounded by four fairies sold for £15,000 ($19,620). The other showing Iris with a Gnome fetched £5,400 ($7,062). Chris Albury, senior auctioneer and valuer for Dominic Winter Auctioneers in Cirencester, England, said the photographs "are surprisingly rare and much sought after." He added: "These two photographs are from 1917, but were likely printed for sale in 1920, to be sold at theosophical lectures advocating a belief in spiritualism." In 1983 the elderly Elsie and Frances confessed that the photographs had been faked. 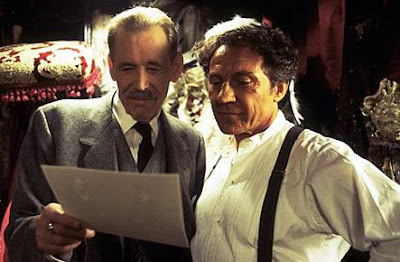 The 1997 film FairyTale: A True Story portrayed Houdini (Harvey Keitel) and Sir Arthur Conan Doyle (Peter O'Toole) investigating the Cottingley Fairy phenomena. But in real life, Houdini was never involved in the investigation. Fairy Photo: Dominic Winter Auctioneers. Episode 1 is an Intro podcast. I give you a little taste of what to expect. The first segment of The Magic History Minute is on there, as is the Feature segment, which deals with Houdini in Germany. I've decided to refer to all the future Houdini sessions as HOUDINI RADIO. There are a couple plugs and even a mention of two of my favorite websites that are NOT mine. Visit the official website and/or subscribe via your favorite podcatcher. 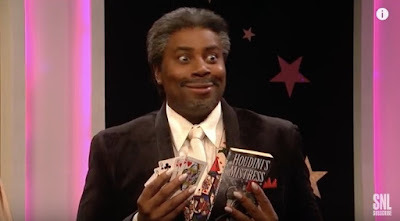 Last night's Saturday Night Live featured a game show sketch called "So You're Willing to Date a Magician". It was pretty funny and the YouTube is making the rounds of the magic groups on Facebook today. Of course, I loved the reference to the book Houdini's Mistress that "Marconius Wilde" (Kenan Thompson) produces from the pocket of Leslie Jones. But despite a peek at the cover art (above), know this isn't a real book. Although The Secret Life of Mrs. London by Rebecca Rosenberg comes close! This isn't Houdini's first name check on the long running show. That happened in 1976 with a Halloween sketch featuring the great Garrett Morris at Houdini's (real) grave in Queens. Thanks to Mark Willoughby for the alert. LIVE from Machpelah Cemetery, it's Saturday Night! LINK: Terror Island exhibition ends today...or does it? Today is the last day to see the exhibition Houdini: Terror on the Magic Isle at the Catalina Island Museum. 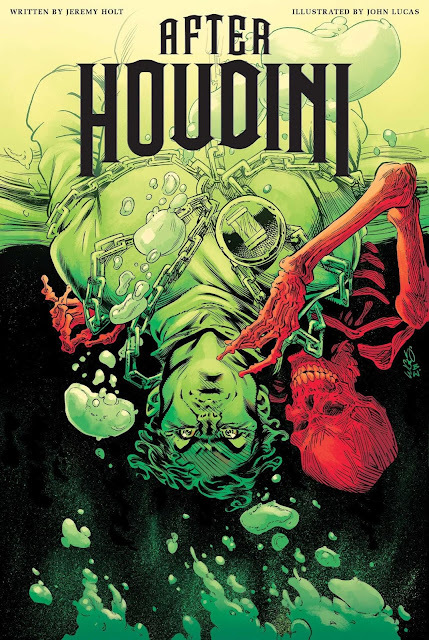 But Joe Notaro has the scoop on what's coming next for Houdini at the museum, and it's great news! Click on the headline link to have a read at Harry Houdini Circumstantial Evidence. 1916: President Wilson and first lady attend Houdini's performance in Washington, D.C.